And this platform will readily help you. BeeTube is truly a much more sophisticated platform then its counterparts. The platform welcomes contribution of videos by different users. 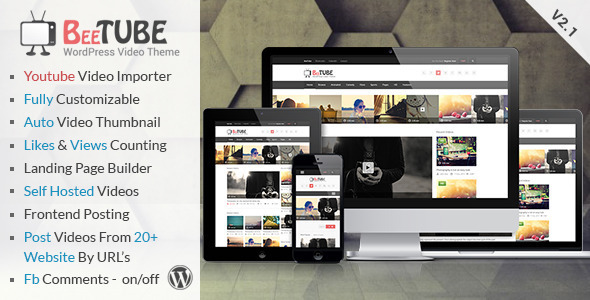 Whether you want to showcase or collect videos BeeTube facilitates everything. Landing page builder with section drag & drop. Image ads and ad code, both functionality Included. LikeUser can like your post without login. No need for registration for post like. Advertising: Advertisement widget will use to show ads. Latest Tweets: Latest tweet widget using twitter api and will show latest tweets from your account. Query Post: Query post widget to show posts in the sidebar. Related Post: Related post widget will show single video related posts. - New User registration function added. - Allow User to post on your website. - Email Verification on user signup. - Login and register button added on top navbar. - Custom Login and register page template added. - Featured video slider ON/OFF function added for landing page. - Top Search Bar update. - A new like count display on thumbnails. - Footer Background Color ,text color and hover efects changed.